Posted on Wed, Jun 5, 2013 : 8 a.m. Yes, there is a national holiday for virtually any food! And today, it's National Ketchup Day. I debated various options for celebrating this occasion. Attempt to make the ketchup more sophisticated, either by making my own or by incorporating it into an elegant dish? Or wallow in its pedestrian, kid-friendly glory by keeping its integrity intact? I chose to let the ketchup shine through. I am, after all, a devotee of kitsch (much to my boyfriend's, and others', amusement and occasional chagrin). Ketchup, or more specifically tomato ketchup, is a thick, tangy condiment made primarily from tomato concentrate. It gets its tang from vinegar, it sweetness from sugar or corn syrup, and its characteristic flavor from salt and spices, like onion powder. An iconic American condiment, ketchup is used on hamburgers, french fries, and hot dogs, as well as on other sandwiches and even breakfast foods. In addition to being a condiment, ketchup is a key ingredient in many dishes and other sauces. So, where does one go to look for ways to use this "iconic American condiment"? Why, to the source, of course: Heinz.com. Heinz sells "650 million bottles of Heinz ketchup every year and approximately two single-serve packets of ketchup for every man, woman and child on the planet." And there, I found the classic recipe for meatloaf... the one we all remember from childhood, the one that's served at diners, the one we think of when we hear the word "meatloaf." Not only is there ketchup in the dish, but a ketchup-based sauce is served on top. When you chill it and slice it and make a meatloaf sandwich, you will undoubtedly add another schmear of ketchup. We all love ketchup, whether we'll admit it publicly or not. So today, enjoy! Preheat oven to 350 degrees. Heat oil in a skillet set over medium heat. Cook onion and celery until softened, about 5 minutes. Stir in ketchup. Remove pan from heat and divide sauce mixture in half. Combine one half of the sauce with ground beef, breadcrumbs, egg, salt, and pepper. Mix gently. Pat mixture into a lightly greased meatloaf pan. Bake for 1 hour or until an instant-read thermometer reaches 165 degrees. Rest meatloaf for 5 minutes. Reheat the reserved sauce mixture. 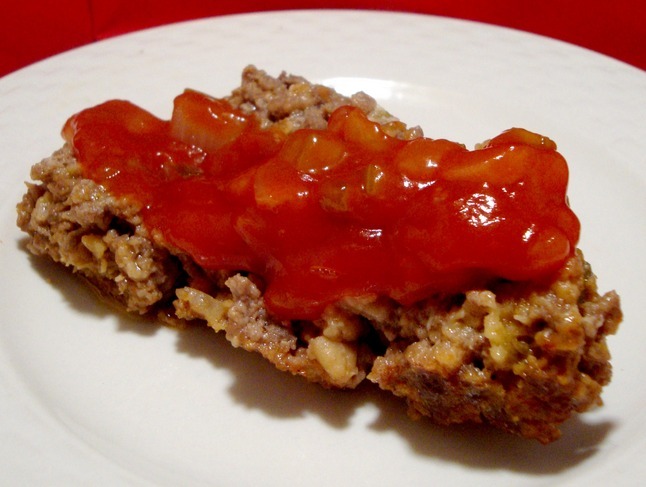 Slice meatloaf and serve with sauce. Mary Bilyeu - a self-proclaimed Food Floozie (named for her blog, which is taking a summer vacation) - writes for AnnArbor.com on Tuesdays, Wednesdays, and Fridays, telling about her adventures in the kitchen ... whatever strikes her fancy. She is also on a mission to find great deals for her Frugal Floozie Friday posts, seeking fabulous food at restaurants on the limited budget of only $5 per person. Feel free to email her with questions, comments, or suggestions: yentamary@gmail.com. Thu, Jun 6, 2013 : 3:02 p.m. I've been trying for years to recreate my mom's terrific meatloaf, but it never came out right; mine never had that &quot;tang&quot; that I remembered her's had. I always used a can of plain tomato sauce in mine, never realizing it was ketchup that she must have used to give it that zesty taste. Thanks Mary, I'll be eating delicious meatloaf sandwiches all weekend! Fri, Jun 7, 2013 : 2:38 p.m.
Oh, I do hope this is &quot;the one!&quot; It's so hard to recreate taste memory. I hope the ketchup is, indeed, the secret you've been waiting for ... :) Please let me know!